Two decades after President Bill Clinton promised to "end welfare as we know it," Americans blame government handouts for persistent poverty in the United States more than any other single factor, according to an NBC News/Wall Street Journal poll released Thursday. Given a list of eight factors and asked to choose the one most responsible for the continuing problem of poverty, 24 percent of respondents in the poll chose "too much government welfare that prevents initiative." Whether Americans are too dependent on government was a flashpoint of the presidential campaign last year, and shrinking government has been a focus of the Tea Party movement, which has risen since the election of President Barack Obama. "Lack of job opportunities" was the second most popular answer, at 18 percent, followed by "lack of good educational opportunities" and "breakdown of families," with 13 percent apiece. The other four options in the poll, in descending order, were "lack of work ethic," "lack of government funding," "drugs" and "racial discrimination." Eight percent of respondents said that all eight factors were equally responsible. The NBC News/Wall Street Journal poll asked a similar question about poverty in September 1994, during a congressional campaign that focused in part on personal responsibility and the role of welfare. 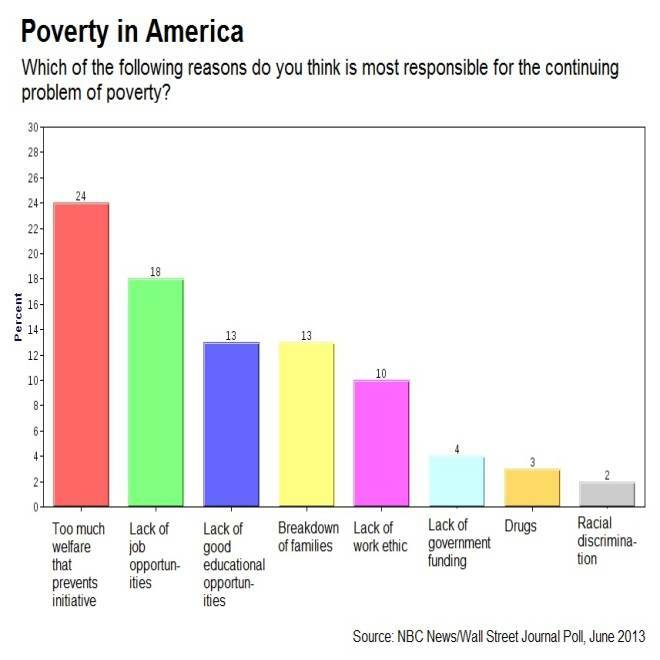 That poll asked about poverty "in our nation’s inner cities," and did not include welfare as a possible response. The leading answer was "lack of job opportunities," at 31 percent, followed by "breakdown of families," at 23 percent. Between the two polls, the shape of country’s approach to fighting poverty has changed markedly — particularly after welfare itself was overhauled in 1996 under Clinton. The number of families receiving cash welfare has dropped by more than half, from about 5 million in the early 1990s to about 2 million in 2011, according to the federal government. At the same time, the number of Americans receiving food stamps has soared, from about 27 million in 1994 to more than 46 million last year, with a spike in the past few years, after the recession struck. The recent poll sampled 1,000 adults from May 30 through June 2, and has a margin of sampling error of plus or minus 3.1 percentage points.